In the coming year, leaders in the food & beverage industry are expected to achieve new goals and expand their optimistic outlook on the future. But what key challenges stand out in 2011, and which priorities should executives focus on to ensure profitable growth? Tompkins Associates (www.tompkinsinc.com) business strategy and supply chain specialists, put together the following list. Guaranteeing product safety, lowering costs, investigating new technologies and improving sourcing and logistics process are all on the list. “If the Great Recession taught us anything, it is that uncertainty is certain,” the company says in revealing its Top 11 Priorities for 2011, which should help food & beverage companies navigate through the uncertainty. 1. Push for Fresh and Organic: Consumers are increasingly looking for freshness and organic authenticity in their food and beverage products, but sourcing and quality constantly challenges suppliers, distributors and retailers. Place greater emphasis on achieving high volume growth while increasing margins in this lucrative market segment. 2. Demand Growth in Emerging Markets: It is becoming a smaller world in many ways, as opportunities in emerging markets drive international convergence. Growth-oriented companies will successfully enter these new markets through strategic acquisitions or partnerships while the increased consumption increases their input costs. 3. Sustainability: Companies are looking to sustainable practices and waste elimination to reduce costs and improve their reputations as stewards of the environment. At the same time, they are finding that costs can be lowered, margins increased, and spoiled reduced. All areas of sustainability will become more relevant, including: energy consumption, greenhouse gas emissions, packaging, and water consumption. 4. Operating Cost Reductions: Look for companies to lower overall landed cost by improving methods and practices for managing suppliers through production, distribution and delivery to customers. Benchmarking will become an even more effective tool in identifying ways to reduce costs while increasing customer satisfaction. 5. More Reductions in Working Capital: Inventory reduction strategies will shift from simply slashing inventory to improving Sales, Inventory & Operations Planning (SIOP). In turn, this will impact how Process-People-Technology strategies are implemented. Brand extensions and packaging innovations will continue to increase SKU count, making the task of working capital reductions even more difficult. A strong emphasis on integrating SIOP into your organization will be of great benefit in reducing working capital. 6. Food Safety: Shortfalls and mistakes in food and beverage safety will continue to garner attention from suppliers, regulators and consumers. Industry-wide trends towards global food safety certifications are gaining steam, and this will drive new technologies to improve visibility from the field to the store shelf. 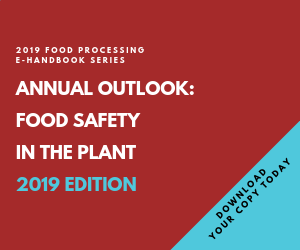 In 2011, it will be important to grasp the affect that the new Food Safety and Modernization Act will have on supply chain visibility, recalls and product traceability (also see No. 11). 7. Lean Management: Using ever improving tools, equipment and technology, companies will need to focus on reducing costly process activities that do not add value to the product or enhance the consumer experience. Make a greater effort to resolve difficult questions such as the value of single versus bulk packaging, brand versus private label, and larger versus smaller sales channels. 8. Procurement Contribution through Sourcing Availability: As commodity prices rise and the emerging markets’ demands for higher value and better quality food increase, identifying and securing reliable, cost competitive sources will become more difficult. Focus more in 2011 on access to suppliers in diverse markets. Purchasing departments will be pushed to obtain competitive prices and ensure a reliable supply channel. 9. Distribution Network Rationalization: Many food and beverage companies are discovering that they are operating outdated and inefficient distribution networks. Distribution is strained by the challenges of getting product to new markets, increasing commodity and transportation costs, meeting demand for greater product freshness, and integrating new acquisitions. Ensure that your distribution and supply chain strategy is fully aligned with your organization’s business growth strategy and that it has the structure and facilities needed to support anticipated growth. 10. Integrating Commodity Purchasing and Logistics Strategies: Look for more food and beverage companies to mitigate commodity price increases by taking control over inbound flows. In the coming year, this will enable many new approaches to maintaining a competitive cost advantage and require new thinking on the part of purchasing and logistics managers. 11. Growing Government Regulation: Food and beverage leaders should become even more proactive in understanding and addressing changes in regulations. Per new legislation, companies will need to track products from the grower, through the supply chain, and to the store shelf, as well as document and test measures on an ongoing basis. It is also critical to realize how to deal with any added costs and maximize any hidden benefits that government regulations may provide. With economic recovery and global growth opportunities gaining steam, 2011 will prove to be one of the more dynamic, if not challenging, times for the food and beverage industry, the firm says. There will be greater pressure to lower supply chain costs at the same time that supply chains are growing more complex. How do you see your operations performing in relation to these Top 11 Priorities for 2011 in the coming months?